The concept of liquid transport has many different aspects that need to be taken under consideration. The commodities being carried, as they relate to bulk liquid transportation sometimes have a public safety component attached to it, since cargo being transported can be anything from volatile acids or solvents to liquefied natural gas (LNG). However, bulk liquid transport also provides a vital link for moving either edible items or the products that go into making them from one destination to another. Trusting liquid transport companies to do the job is why businesses put their faith in them on a daily basis. That’s because the bottom line of a business is materially affected when such products aren’t available due to unreliability with the vehicles hauling these commodities, proper sanitation and sterilization of the tankers or the proper training of the individuals carrying these items. A breakdown anywhere within that group results in an inability to deliver their product to a company’s own customers. That can be a catastrophe for that firm and put them on the fast track to oblivion. For example, one look at the nutritional facts on the back of any food item shows just how important even one commodity can be during production. That dizzying array of products has to work in concert, so much so that if there happens to be a glitch somewhere along the way, the production of that item undoubtedly comes to a standstill. From vegetable oils to syrups and sweeteners, as well as additives and preservatives, these items bring out the taste that consumers expect in every bite of food or sip of a drink. The thought of your favorite food or drink leaving out one of these items just to maintain a frenzied production schedule is unthinkable, but without this portion of the process in place, that’s exactly what would occur. The dairy aisle of any supermarket is another area where this industry shows just how important its contributions are when it comes to convenience for the consumer. Milks and creams, whether pasteurized or not, have to be maintained properly during transport and have a short shelf life regardless. That means the middleman that transports such items is the integral link to that overall equation. Another segment of the economy whose lifeblood depends on successful bulk liquid transport is the spirits industry. Getting their product to liquor stores, bars, nightclubs and other venues doesn’t happen in a vacuum. In reality, those businesses cease to exist without the connection that a bulk liquid transportation company can provide. As opposed to the standard hauling of items, bulk liquid transportation brings with it a host of industry regulations that have to be followed. Perhaps chief among these is the cleanliness aspect of an operation, especially for those transporting edible items. One prime example is the USDA inspections that come with the transportation of milk. No legitimate transport business would think of moving milk products without making sure that the chain of command with respect to this area has been followed to the letter. Another area that some may not even consider, but is no less vital to a select segment of the population is having the food product Kosher certified. Transport companies have to factor this issue in when assessing the overall market, since enough demand exists for it to now be commonplace. Not only is bulk liquid transport a vital and necessary component of enhancing both the overall economy of the country and the health of its citizens, but it helps in food production and consumption overseas. The industry has a variety of shipping options, with the additional time needed for the commodities to reach their ultimate destination something that goes into the overall planning. So, while some may take the liquid transport industry for granted, the businesses that rely on it every day can’t afford to take such a cavalier attitude. That’s why they look in the direction of this industry when the time comes to ship their liquid-based product. 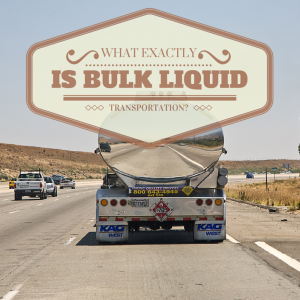 For more information on what we can do for your bulk liquid logistics, contact Kan-Haul today!